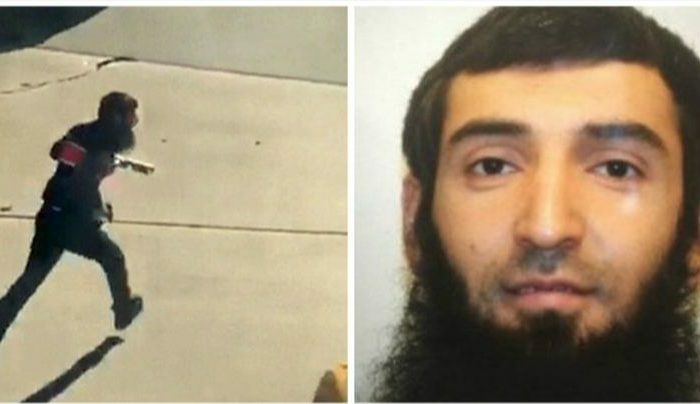 Incredible video footage shows Sayfullo Saipov, the 29-year-old suspect in the Manhattan terrorist attack that left eight dead and several injured on Tuesday, running and waving a fake gun around. Reports say that he was shot in the stomach by NYPD officer Ryan Nash, who is being called a hero. The footage was filmed from an office building in Lower Manhattan. It shows him running in the street carrying a paintball gun and a pellet gun, according to the New York Times, citing local law enforcement officials. Police thought they were real weapons. Nash shot Saipov, causing him to buckle over and collapse in the street, the New York Daily News reported. The officer is assigned to Lower Manhattan’s 1st Precinct. “I want [to] commend the response of our NYPD officer that was on post near the location who stopped the carnage moments after it began,” O’Neill told reporters. Sources told NBC News that a note saying he pledged to the ISIS terrorist group was found in the Home Depot truck he used to attack people. Saipov, a native of Uzbekistan, came to the United States in 2010. He’s accused to driving a truck on the West Side Highway bike path on Tuesday, officials said. He also reportedly shouted, “Allahu Akbar,” before he was shot by police. “He was very happy guy. He liked the US. He is no terrorist. He’s all the time happy, smiling all the time,” Kobiljon Matkarov, a fellow Uzbek national who knew him when he lived in Florida, told NBC. Officials told NBC that he rented the Home Depot truck at around 2 p.m. in Passaic, New Jersey, and drove to Manhattan. At 3:05 p.m., he drove the truck onto the bike path. “This was an act of terror, and a particularly cowardly act of terror aimed at innocent civilians,” New York City Mayor Bill de Blasio said about the attack, CBS News reported. “Today there was a loss of innocent life in lower Manhattan,” NYPD commissioner James O’Neill said Tuesday.